Both presidential candidates also condemned the attacks, with Republican Donald Trump declaring “this is war” and Democrat Hillary Clinton vowing “we will not be intimidated. European Council president Donald Tusk expressed consternation that France was attacked on its national day and said the world stands united with the French people. “It is a tragic paradox that the victims of the attack people celebrating liberty, quality and fraternity. We will stand united with the families of victims, the French people and the government in the fight against violence and hatred,” Tusk said at a meeting of Asian and European leaders in the Mongolian capital of Ulaanbaatar. Foreign Minister Didier Reynders expressed dismay that France was once again the target of an apparent terrorist attack. “We condemn such an attack, maybe a terrorist attack, but such an attack in France again,” he said. Prime Minister Narendra Modi condemned what he called a mindless attack. “I am appalled by the horrific attack in Nice. I strongly condemn such mindless acts of violence. My thoughts are with the families of deceased. I hope the injured recover soon. India shares the pain and stands firmly with our French sisters and brothers in this hour of immense sadness,” Modi said. Prime Minister Nawaz Sharif said the government and people of Pakistan were deeply saddened by the attack. “Being the frontline state in the war against terror, Pakistan itself has suffered immensely and has seen a series of tragedies,” he said. Foreign Minister Julie Bishop said three Australians suffered minor injuries while fleeing the scene. 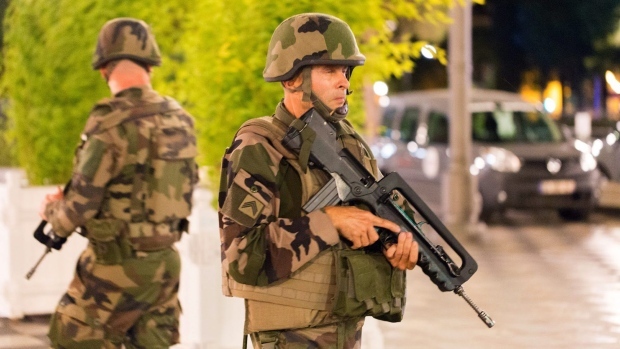 “We support our friends and partners in France and we join with others around the world in hoping that this will be the end of this type of horrific incident that is targeted at unarmed civilians,” she said. The state-run Kuwait News Agency said the ruling emir, Sheikh Sabah Al Ahmad Al Sabah, sent a cable of condolence to French President Francois Hollande over the assault. Sheikh Sabah said Kuwait “supports all measures France might take to protect its security against the terrorist acts.” The Kuwaiti Embassy in Paris also urged its citizens in France to be careful while checking to make sure none of its citizens were wounded. Tiny Kuwait faced an Islamic State group suicide attack last year during Ramadan at a Shiite mosque which killed at least 27 people and wounded 227. The seven sheikhdoms of the United Arab Emirates condemned the “heinous terrorist crime” that struck Nice. In a statement Friday on the state-run WAM news agency, Emirati Foreign Minister Sheikh Abdullah bin Zayed Al Nahyan pledged to stand with the people of France after the assault. The UAE is part of the U.S.-led coalition targeting the Islamic State group and hosts American and Western military personnel involved in the fight. While its neighbours have been struck by extremis attacks, the UAE’s capital of Abu Dhabi and its commercial hub of Dubai have escaped the violence. Foreign Minister Jose Manuel Garcia-Margallo said he called his counterparts in France to express his condolences. “We are very sorry and very much with the French people and the French government,” he said in at a meeting of Asian and European leaders in the Mongolian capital of Ulaanbaatar. Next Post: Is Terrorism Getting Worse?